Who says you need to leave the Metro to relax? We both studied Tertiary in Manila but didn’t really had the chance to explore the area. Now is the perfect time for us to rediscover the busiest City in the Philippines. I think this is a great start and trial for Zoomanity. Every 1st Saturday of the month to test the market and see where it goes. I hope Pasig River could be saved. In other countries, I noticed the riverfront are some of the most expensive properties. Pasig River could be like that one day too. I didn’t know those theme parks belong to one company. How interesting! I think we need more attractions like this in our country especially those which will bring us closer to nature and encourage love of art, history and culture. I wish for the company’s success in this regard. So far, I’ve visited four zoos of Zoomanity and more to go. It is nice to know about the Zooper Cruise because this will be a new attraction in Metro Manila. Though I find the rate expensive but I do hope that it is worth it. I will wait for more reviews before I will try it. I have read an article somehow similar to this, and I was really intrigued. Is it really possible to revive the Pasig River? The stench remains in my mind, and I just thought it woud be challenging to arrange cruises on the river. But if this news is indeed true, then, I am very pleased and proud! It is a very good initiative to finally generate something useful from the river. My bf and I love cruises, and I have high hopes that the project will be good (or better) when we get the chance. I think this will do very great for our tourism! Plus, now that the Pasig river is way so much better than it was years ago (although there will still be so much work to be done) I’m sure many will be surprised and amazed at how it can actually be used for greater and other purposes such as this! I’m glad the cruise is back. Before we were supposed to take the cruise with my college friends. That’s about the time it closed though, we were very unlucky. I think we should do a revenge-cruise soon! How many hours will the Zooper Cruise be? Is it a hop-on and hop-off kind of tour? Or everything will just be seen at a distance. Anyway, I’m sure foreign tourists will find value in this. Hope Pasig river can be fully rehabilitated to attract more tourists. 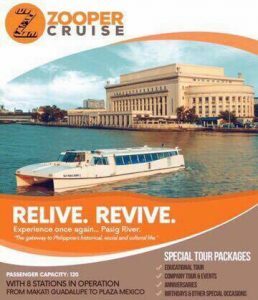 Good thing that they are now reviving the Pasig River. If I’m correct, transpo via the river is already running right. And this one is mainly for cruise? Do they cleaned up water lillies all over the river? It might just cause trouble to the boats and not also that pleasant to the eyes.